One of the most common complaints that cat owners make is that a cat will not use its litter box properly. 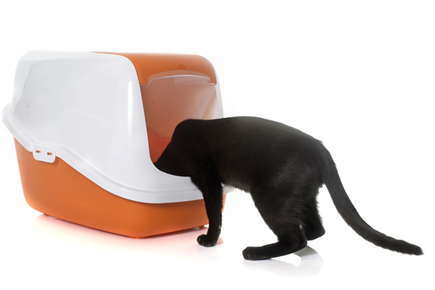 Usually it is a problem with the cat urinating outside the box, but occasionally a cat will be defecating outside the box, or a cat may not want to use his litter box at all! First the cat should be examined by a veterinarian to check for a medical problem, such as a urinary tract infection. Sometimes there are behavior problems, especially in multiple cat households, that can lead to the frustrating scenario of cleaning pee and poop off your carpet! But, there are things that cat owners may do unwittingly that lead to or exacerbate this problem. You don't want to give them a reason not to use the box! 1. Have one more litter box than you have cats. If you have one cat, you should have two litter boxes. If you have three cats, you should have four litter boxes. 2. Do not locate all the litter boxes in one area. Put them in different rooms. One cat may dominate one room and not allow the other cats to use the boxes. 3. Don't put food and water bowls close to the litter boxes. Do you want to eat next to your toilet? Cats are very sensitive to smells. 4. Don't locate the litter boxes next to the washer and dryer where the "boogeyman" may live, or any other areas where loud sounds may emanate. Hearing a scary noise once may make them reluctant to use that area for months. 5. Do not use liners under the litter. Many cats do not like them. 6. Do not use covers over the box. It keeps odors in, just like a portable toilet (PortaPotty). Think what that smells like; you wouldn't want to use it either! 7. Use a litter without deodorizers or scents. Again, cats are sensitive to odors and don't like scented litter. The majority of cats like a clumping litter, but this is a very individual preference. 8. Clean the litter boxes by scooping them at least once, preferably twice, daily. At least once weekly dump the litter, clean the boxes, and refill with new litter. Do not clean the boxes using any cleanser with a strong odor. Cleaning with just hot water and a mild soap is fine. If your kitty still doesn't want to use his litter box, talk to your veterinarian about behavior modification, and even behavior drugs, that can be used.